Hallowe’en makes me think about another one of my favorite board games with a spooky theme. Last year at this time I revisited Milton Bradley’s Which Witch? This year, I’m nostalgic about another classic, Green Ghost from TRANSOGRAM. 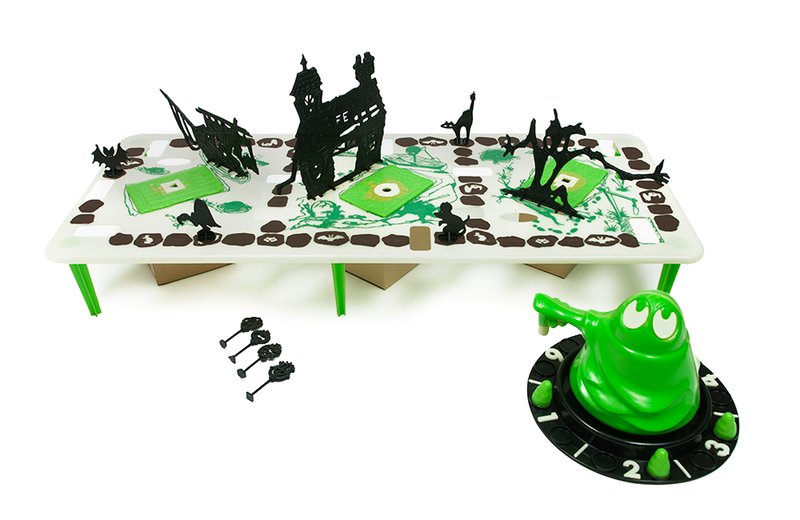 The game originally appeared in 1965 and was touted as, “the luminous game you can play in the dark.” To support lights-out gameplay, Green Ghost included a glow-in-the-dark game board and a variety of phosphorescent playing pieces. Setting up Green Ghost is half the fun. The game board is elevated on 6 legs, which allows for a series of three crypts (cardboard boxes) to be placed beneath it. Each crypt is filled with snakes, bones, and bat feathers respectively, and secured with a “crypt cover” featuring a luminous keyhole. Setup is completed with the addition of three pieces of spooky scenery: a shipwreck, haunted house, and gnarled tree. Green Ghost is truly a family affair. The premise is that the Green Ghost is in search of his son, Kelly, who is hiding among the bones, snakes, and bats in the haunted town of Spookyville. Kelly’s squad of friends includes 11 other little ghosts with odd names like Bottle, Emerald, Chartreuse, and Bilious. Players help the Green Ghost in his quest by taking on the role of one of his “pets” by choosing either a cat, bat, rat, or vulture playing piece. Gameplay includes moving around the board, opening up crypts with special keys, and collecting ghost children. Once all the ghost children have been collected, they are placed on the large central spinner in the shape of, you guessed it, a giant green ghost. The ghost is spun and whichever child it points to is Kelly. Whichever player collected that particular ghost child is declared the winner. Due to its uniqueness, Green Ghost has remained a fan favorite over the years. In 1997, Marx reissued the game. The reissue remained faithful to the original version and even included some of the original box art. Rather than forcing your friends to endure an impromptu slideshow from your family road trip to the Grand Canyon, you could instead regale them with selections from your library of standard View-Master picture reels. In 1981, Ideal released The Missing Link, a challenging mechanical 3D puzzle and a worthy follow-up to its iconic Rubik’s Cube.